If you are in charge of food preparation, you must be trained and designated as a Certified Food Protection Manager, according to the 2017 FDA Food Code. You must always be on site whenever the facility is in operation. Take extra precautions when wearing bandages. The 2017 FDA Food Codestates you should cover them with single-use gloves to reduce the chance of physical hazard. Bandages can fall off; you also want to protect against wound leakage. Fake fingernails can be a health hazard. As such, managers may ask employees to remove them. Fake nails are difficult to keep clean and could easily break off and fall into food during the prep process. Wearing a clean hat, hair net or hair covering that completely restrains your hair is essential when prepping food or working in areas used to clean utensils and other equipment. Aprons must be worn when prepping food, but must be removed when using the restroom or taking out garbage. 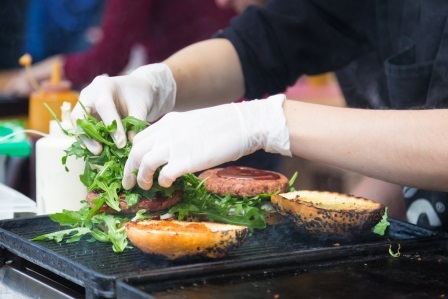 Staff must wear gloves when handling or preparing ready-to-eat foods. They don’t have to be worn when cleaning tables. Sick employees, especially if they’ve suffered from vomiting, diarrhea, sore throat and fever, must be symptom free for 24 hours before returning to work. During the month of September, we’ll offer a series of articles devoted to food safety and National Food Safety Month protocols. Also, visit Food Safety Focus for more information about food safety practices for commercial kitchens.